Don’t see yourself on the list? Let the library know about your Open Access efforts. 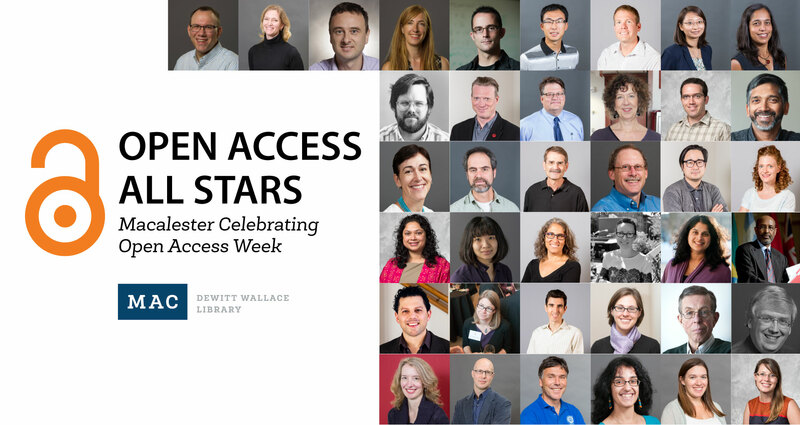 DeWitt Wallace Library is celebrating Mac community members that support open access by publishing scholarship as Open Access, serving as editors of open access journals, and creating open educational resources. Stop by to to let us know about your open access publishing efforts or to learn more about how Macalester and the DeWitt Wallace Library actively support open access to scholarship and educational resources. Make your next scholarly article open access: The library sets aside a small fund to pay Article Processing Charges (APCs) for some articles to make them openly accessible. We have funded more than 28 articles since 2010. Our priority is for funding articles co-written by faculty and students. APCs for other articles will be paid if they are published in fully open access journals.